The ability to write code in assembly is essential to achieving the best performance for a GPU program. In a previous blog we described how to combine several languages in a single program using ROCm and Hsaco. This article explains how to produce Hsaco from assembly code and also takes a closer look at some new features of the GCN architecture. I’d like to thank Ilya Perminov of Luxsoft for co-authoring this blog post. The program may be written in a high level language that does not expose all of the features available on the hardware. The compiler is unable to produce optimal ISA code, either because the compiler needs to ‘play it safe’ while adhering to the semantics of a language or because the compiler itself is generating un-optimized code. Consider a program that uses one of GCN’s new features (source code is available on GitHub). Recent hardware architecture updates—DPP and DS Permute instructions—enable efficient data sharing between wavefront lanes. To become more familiar with the instruction set, review the GCN ISA Reference Guide. Note: the assembler is currently experimental; some of syntax we describe may change. Two new instructions, ds_permute_b32 and ds_bpermute_b32 , allow VGPR data to move between lanes on the basis of an index from another VGPR. These instructions use LDS hardware to route data between the 64 lanes, but they don’t write to LDS memory. The difference between them is what to index: the source-lane ID or the destination-lane ID. In other words, ds_permute_b32 says “put my lane data in lane i,” and ds_bpermute_b32 says “read data from lane i.” The GCN ISA Reference Guide provides a more formal description. Formal HSA arguments are passed to a kernel using a special read-only memory segment called kernarg . Before a wavefront starts, the base address of the kernarg segment is written to an SGPR pair. 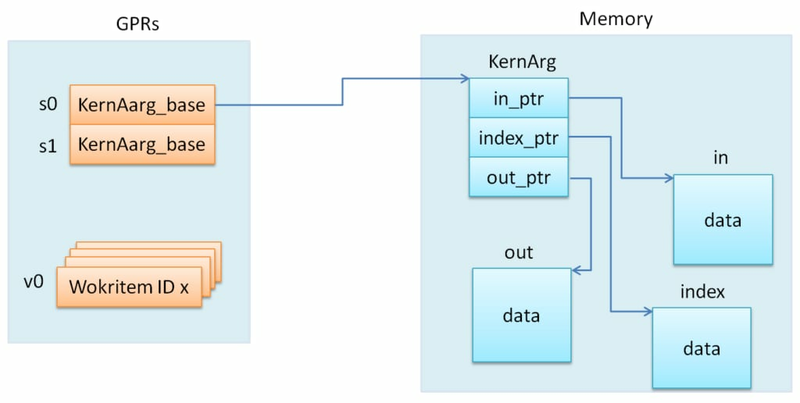 The memory layout of variables in kernarg must employ the same order as the list of kernel formal arguments, starting at offset 0, with no padding between variables—except to honor the requirements of natural alignment and any align qualifier. * This is the host-side representation of the kernel arguments that the simplePermute kernel expects. * Allocate the kernel-argument buffer from the correct region. .hsa_code_object_isa 8, 0, 3, "AMD", "AMDGPU"
Currently, a programmer must manually set all non-default values to provide the necessary information. Hopefully, this situation will change with new updates that bring automatic register counting and possibly a new syntax to fill that structure. Before the start of every wavefront execution, the GPU sets up the register state on the basis of the enable_sgpr_* and enable_vgpr_* flags. VGPR v0 is always initialized with a work-item ID in the x dimension. Registers v1 and v2 can be initialized with work-item IDs in the y and z dimensions, respectively. Scalar GPRs can be initialized with a work-group ID and work-group count in each dimension, a dispatch ID, and pointers to kernarg , the aql packet, the aql queue, and so on. Again, the AMDGPU-ABI specification contains a full list in in the section on initial register state. For this example, a 64-bit base kernarg address will be stored in the s[0:1] registers (enable_sgpr_kernarg_segment_ptr = 1) , and the work-item thread ID will occupy v0 (by default). Below is the scheme showing initial state for our kernel. The next amd_kernel_code_t fields are obvious: is_ptr64 = 1 says we are in 64-bit mode, and kernarg_segment_byte_size = 24 describes the kernarg segment size. The GPR counting is less straightforward, however. The workitem_vgpr_count holds the number of vector registers that each work item uses, and wavefront_sgpr_count holds the number of scalar registers that a wavefront uses. The code above employs v0–v4 , so workitem_vgpr_count = 5 . But wavefront_sgpr_count = 8 even though the code only shows s0–s5 , since the special registers VCC , FLAT_SCRATCH and XNACK are physically stored as part of the wavefront’s SGPRs in the highest-numbered SGPRs. In this example, FLAT_SCRATCH and XNACK are disabled, so VCC has only two additional registers. The first command assembles an object file from the assembly source, and the second one links everything (you could have multiple source files) into a Hsaco. Now, you can load and run kernels from that Hsaco in a program. The GitHub examples use Cmake to automatically compile ASM sources. In a future post we will cover DPP, another GCN cross-lane feature that allows vector instructions to grab operands from a neighboring lane. Ilya Perminov is a software engineer at Luxoft. He earned his PhD in computer graphics in 2014 from ITMO University in Saint Petersburg, Russia. Ilya interned at AMD in 2015, during which time he worked on graphics-workload tracing and performance modeling. His research interests include real-time rendering techniques, GPUs architecture and GPGPU. Great article and an absolutely tremendous capability exposed here for compute applications. Thank you. This is awesome! I can’t wait to try this on my R9 380. Also congrats for the open-source amdgpu launch day support for Polaris, it’s very cool! Although it mostly handles OpenGL/Vulkan now, I really hope full OpenCL 2.0 support will follow shortly. In fact I bought a RX 480 to try the new GCN features, and also show my appreciation for AMD’s openness. Thank you for your feedback, We are aware of the need to improve our math libraries and have a plan to aggressively improve the situation. First on hcBLAS was a solution developed by MultiCoreWare which is not a full implementation on BLAS 1,2, and 3. HcBLAS supports functions needed for Torch 7. I have updated the documentation to show which function it supports. We have been working with MCW to improve the performance of this library, it is also helping to drive improvements in our new lighting compiler which also affects the performance of this library. On to the future of Math Libraries on ROCm, the Radeon Open Compute team is currently under active development of two new math library for ROCm, rocBLAS, rocFFT which we will be releasing soon. rocBLAS will support a much richer foundation of BLAS 1,2 and 3 functions in the BLAS Library. But we do plan on doing assembly tuning of core BLAS kernels and aggressively looking at compiler optimizations in the HCC lightning compiler to drive BLAS operation to peak level performance. We are also working on very big improvements in the core driver to drive richer performance tools. I want to thank you for your patience as we drive a brand new foundation for GPU Computing via ROCm, it was April just 4 months ago when we released version 1.0 of ROCm and since then we have been driving a large number of new capabilities in core foundation to better enable a much more solid foundation optimizing our application core math libraries. PS I am looking at Bounty Programs in the future. Is it possible to write GCN assembly for OpenGL or Vulkan? Not currently, we are bringing up the assembler for Compute first. Team is investigating support for graphics. Given the references to AMDGPU, does that mean it is not possible to use ROCm to write GCN assembler kernels that will run on machines using the fglrx drivers? Correct, this capability is available only on ROCm platform. We are expanding the platforms supported by ROCM and now include ASICs based on Fiji, Carrizo, Hawaii, and Polaris GPUs. In a recent conversation about abandoning hsail support in llvm, Matt A. said, “The ROCm ABI is the same as the HSAIL ABI”. The fglrx CL2.0 driver generates hsail, which suggests it supports the HSAIL ABI. I know CL2.0 is not supported for southern islands in the fglrx drivers, but it is for sea islands and volcanic islands. So is there some reason a kernel binary generated on the ROCm platform can’t be loaded with the fglrx drivers on a Hawaii GPU? Or is it just a matter of nobody has tried it? Thanks to my father who shared with me regarding this blog, this web site is genuinely amazing.